What an unexpected delight. Scamp’s reputation precedes them, but my only experience of them was the beautifully crafted Private Peaceful (also at the Fringe this year – though I saw it in 2009) – I wasn’t expecting the puppet menagerie awaiting me. Set in the eponymous swamp, Jeff Achtem fills the story with creatures in various forms, but the main story follows the journey of one little man’s determined pursuit of Birdie, his Roadrunner styled nemesis who is always one step ahead of him. 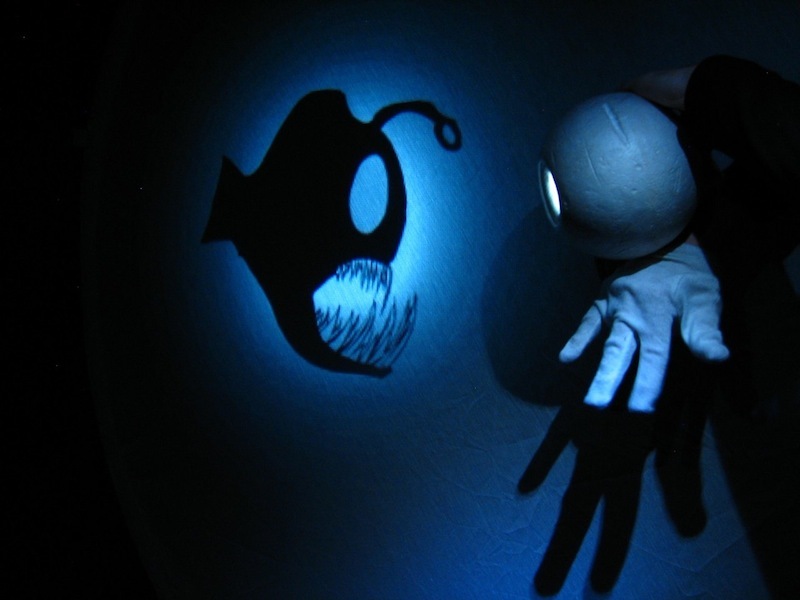 At various stages he involves the audience in creating his beautiful shadow world, inducing squeals of delight from adults and kids alike, and as we reach the end he adds another fantastic element as we all don those familiar red and blue glasses and the shadows become 3D! “Avatar, eat your heart out,” says Jeff – I have to agree! This show is perfect fringe fodder, and deserves to be seen by a much wider audience. I doubt you will ever see shadow puppets so lifelike and full of character – and you’ll find yourself thinking “Here Birdie Birdie Birdie” long after you’ve left the theatre. I went to this show on the recommendation of my twitter feed and thank goodness I did. 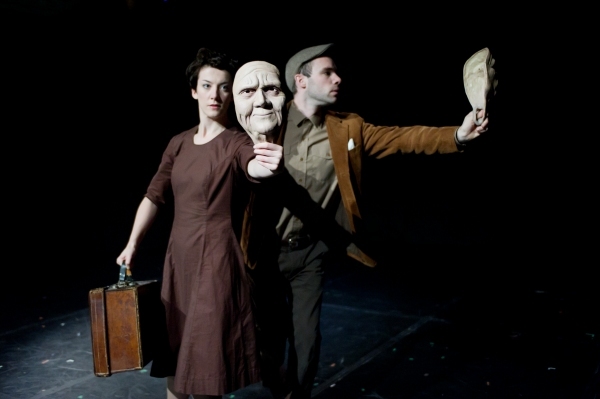 Theatre Ad Infinitum tell the story of a man who is lost following the death of his wife. Lonely and mourning, he copes by reliving treasured memories of his wife and their life together, from meeting and courtship, through to sadder memories of heartbreak and loss. Told entirely without words, with only an accordion/singer for accompaniment, this show could very easily have slipped into schmaltz, but instead this show packs an emotional punch I don’t think I’ve ever experienced before in a theatre. The masks used to portray the elderly couple force meaning into the simplest of gesture. A tapping finger, a glance to the left – all create a full and moving picture of a man bereft of his life partner. The lack of words was heartbreaking – there was no weeping or wailing, no beating of the chest – instead there was an unspoken sense of loss that needed no words. The man and his wife’s older selves are played using handheld masks that are pulled away when they play the younger versions of themselves. The effect is extraordinarily poignant, their whole bodies becoming younger and more full of life. George Mann and Deborah Pugh delicately portray these scenes of the younger couple – the movements suggesting snapshots of utter happiness. Even an argument between the couple becomes just another expression of love. Perhaps the moment that will remains with me longest is that of our elderly friend distracting himself from his loneliness by making a cup of tea – only to absent-mindedly pick up two cups from the cupboard. As I describe this I realise I am making it sound like a maudlin and depressing tale, when that couldn’t be further from the truth. For each moment of sadness there is another of joy as we celebrate their incredible life together. I rarely give praise without fault, but I fell completely in love with this show. I, like most of the sell-out audience, wept unashamedly as Theatre Ad Infinitum taught us that death isn’t really the end, so long as we keep the memory of loved ones alive. See this show. Bring tissues and tell your friends, such a sublime and beautiful piece of theatre should be seen by as many people as possible. It’s astounding how much you can say without words, and this company says it perfectly. Forest Fringe is, in my opinion, the greatest venue the fringe has to offer. With free tickets and a bohemian style, the place seems to encapsulate exactly what the Fringe is all about. This fun little show is set in the middle of a comedians failing comedy set, and as if his day couldn’t get any worse, he’s going to be shot at the end of the set. Written by Ross Sutherland Comedian Dies In The Middle Of Joke is an interactive play for small groups, where audience members take it in turns to play the various parts on offer. There’s the sycophantic agent, the party table, the insulted soldier and many more, and a fortunate few even get a chance to be the comedian. The reason everyone changes around so much is that our eponymous comedian is stuck in a 6 minute time loop – and no matter what happens, he’s going to die at the end of that 6 minutes. If nothing else, this show was really great fun. There was something really engaging about coming up with various lines and barbs depending on the character you were playing, and the ‘6 minute loop’ repetition was quite effective as we witnessed our comedian struggling to overcome the inevitable. It was also a very social event – I went in alone, but I emerged chatting animatedly about the show and agreeing to meet my fellow audience members for a drink. Saying that, this show isn’t going to change lives. It has a powerful ending, and the repetition is very effective, but when you boil this show down, it’s really just a very clever parlour game. However, this was a parlour game I was more than happy to play. Another Forest Fringe show (I told you I love that venue! ), Crunch is pretty unique for fringe shows. Part lecture, part sales pitch, part motivational life coaching, Crunch examines the worlds over-reliance on money, and asks us to question this once in a while. In his sharp suit and slicked back hair style, Gary McNair presents his lecture on the money, explaining its history, and presenting it to us for what it really is, just a belief system like any other. He asks us to enter his five-step programme to rid ourselves of the tyranny of money and take back control. After all, he explains, we are the ones who really decide the value of that bit of paper with £10 printed on it. McNair is honest and charming, and uses various techniques to show audiences the true value of money. There is an auction for a sealed envelope containing an unknown sum of money, and as he attempts to purchase a bag from an audience member he offers things that, perhaps, have more worth – building your flat pack furniture for example, or cooking you a meal. However, what most people will be talking about when they leave is the moment when Mcnair, like a faith healer or preacher, invites people up onto the stage to be ‘cured’ of their obsession with money. He then unveils a shredder and asks for volunteers to take the money from their wallets and shred it. What is fascinating is the amount of people that queue up to do it. They laugh in delight as their money is shredded before their eyes and take away the tiny pieces as a souvenir. Some throw them in the air like confetti, some take them grinning back to their seats, but all look happy and satisfied with their decision to do it. Crunch, oddly, leaves you feeling quite good about yourself. McNair isn’t telling anyone to live without money, that would be impossible, but he is asking his audience to see it for what it is – unimportant in the grand scheme of things. It’s a refreshing message, and while I didn’t get up there to shred my hard-earned cash, I did leave with a much lighter view of my financial situation: after all, it’s only money.